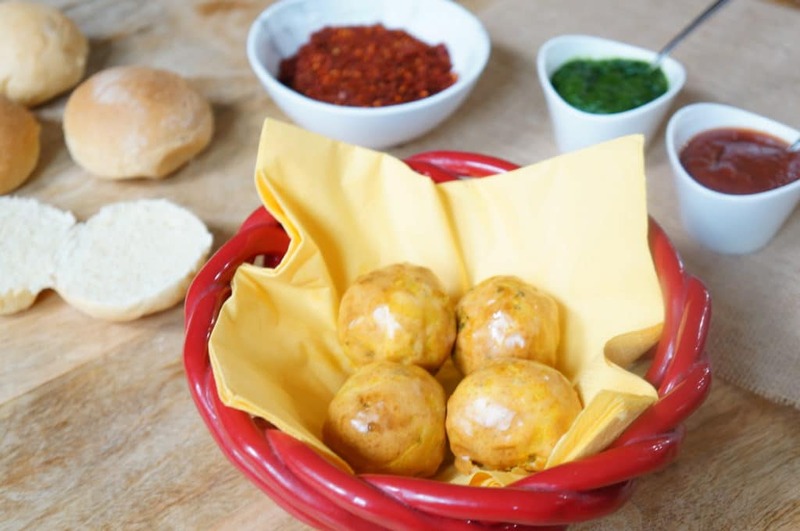 Potato Fritter Sliders, is a game day twist of the humble Mumbai street food, Vada Pav. A fried potato fritter is stuffed in between dinner rolls, along with sweet and spicy sauces or chutney. Game day is right around the corner. I am not a huge sports fan…however I absolutely enjoy the super bowl parties for all the fun, food and socializing. Trivia question…what would be the best Indian food to add to your super bowl party? I must say it will be hard to beat this one….POTATO FRITTER SLIDERS or our very own and humble Vada Pav. 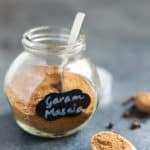 It is the most popular street food of Mumbai got a make-over to make it’s grand appearance at the Superbowl party. 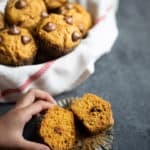 It is also Vegan and can be made Gluten-free, hence great for any dietary considerations. I recently shared the Vada Pav recipe, and thought that it literally is one of the most loved food for Indian parties. Well, potato, fried, lots of chutney’s. What’s not to love?? 🙂 As I was thinking of what sliders to make for the superbowl party, it struck me that I can re-purpose the vada pav for it. So here it is….Potato Fritter Sliders! 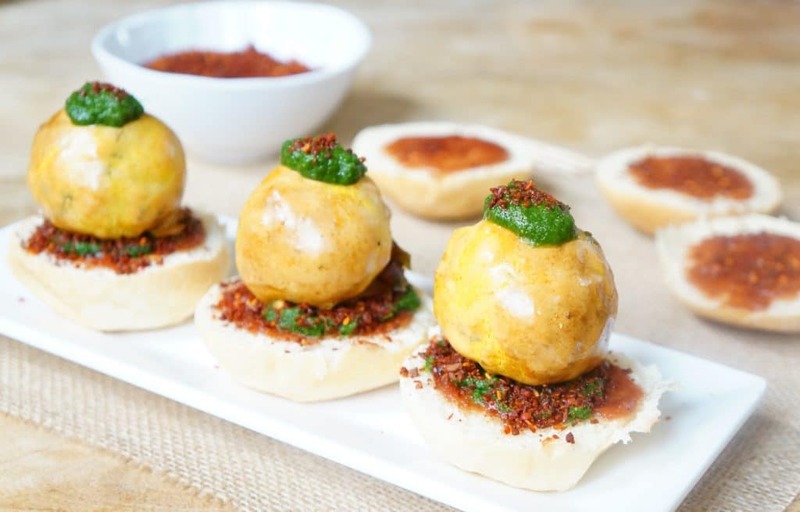 Let me explain what this includes – It is a spiced mashed potato filling coated with chickpea flour batter and fried, then sandwiched in between of a mini-burger bun or dinner roll, along with sweet and spicy sauces (or chutney). I use 3 different chutney’s or sauces in this – Tamarind & Date, Mint Cilantro and Spicy Chili Garlic chutney. 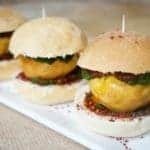 How to make Potato Sliders in the Air Fryer? I know you don’t mind fried food on game day at all. However I find these fritters easier to make in the Air Fryer. I don’t like the thought of having to heat a whole large pan of oil, which spreads the smell in the whole house. The main part of this slider is the Mashed Potato Fritter. 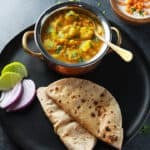 It is made with mashed potatoes combined with mustard seeds, lots of ginger, garlic, green chili (optional) and ground turmeric. These are made into balls (similar to meatballs) and coated in a chickpea flour batter. Then air fried to make a wonderful potato fritter patty. 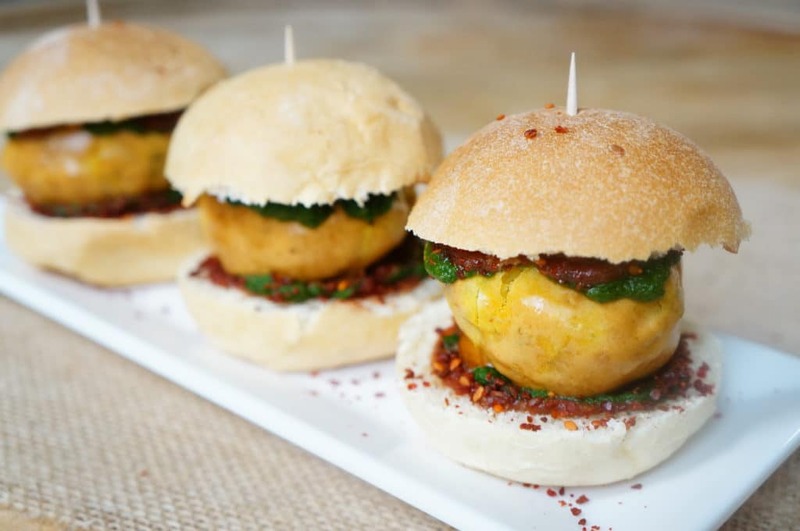 I am using Indian Chutney’s with these Sliders, but hey…you don’t really have to. 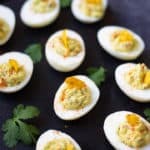 Think Chipotle Mayo, Avocado Salsa or a Pesto Mayo spread! Any of these could work 🙂 You can also add cheese, lettuce, a slice of onion or tomato if you like. I found perfect size dinner rolls at the local Target store. Any slider bun or mini-burger buns would work for this. You can toast or grill the buns with some butter, spread the tamarind and Mint chutney’s, sprinkle some chili garlic chutney powder. Now place the top of the dinner rolls on the fritter. Viola…Potato Fritter Slider is ready! Check out other popular vegetarian appetizers – Tandoori Gobi, Paneer Puff Pastry, Chickpea Squash Fritters and Crispy Brussels Sprouts. Mix all batter ingredients together to form a thick smooth paste. Let this batter rest until you prepare the stuffing. Mash the boiled peeled potatoes using your hand or a potato masher. You want them broken down, but not mushy. In a pan on stovetop (or in the instant pot on saute mode), heat oil. Add the mustard seeds, curry leaves. Let the mustard seeds pop. Add asafoetida, minced green chili, ginger, garlic and saute for 30 seconds until the raw smell is gone. Add salt, turmeric, cilantro and then quickly add the potatoes. Mix well. Add lemon juice and mix well with the potatoes. Take the potato stuffing off heat and let it cool. 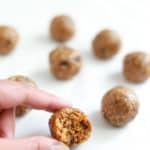 Make small to medium sized balls with the potato stuffing using your hand. Brush oil on the air fryer grill pan. Mix the batter you prepared so it is smooth. Dip the potato balls in the batter, coat evenly and place them on the air fryer grill pan. Depending on the space you have add 4 or more at once, keeping space between them. Set at 390°F in Air fryer for 14 minutes. Check half way through. Carefully remove the fritters from the grill pan. While the fritters are being prepared, slice the dinner rolls into 2 pieces. Apply tamarind and green chutney on both sides of the dinner rolls. Sprinkle some dry chili garlic chutney. Place the fritters in between the dinner rolls and press gently. Gently press a little and serve immediately. Stovetop variation: The spiced potato balls can also be fried in hot oil on the stovetop. Sauce Variations: I used Indian Chutney’s with these Sliders. You can also vary with using other spread's such as Chipotle Mayo, Avocado Salsa, Pesto Mayo, etc. You can also add cheese, lettuce, a slice of onion or tomato if you like.